As a sea turtle volunteer, I have spent the last few weeks here in the Osa constructing the turtle hatchery for the upcoming nesting season. Each year, the hatchery is moved to a new location along the beach in order to relocate nests in an area with “clean” sand which was not used in the previous nesting season. The process is long and tough and requires many hours and many hands, but the end product is so rewarding that the work is well worth it. We begin the project by moving barriers from the old hatchery to the site of the new one. 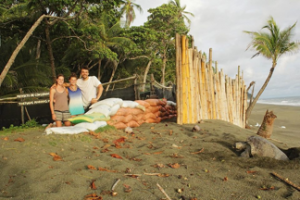 The barriers are made of bamboo, which protects the hatchery and the nests inside from the large high tide waves of the Pacific Ocean. Next we begin the important step of sifting the sand one meter down (about the depth of a sea turtle nest). This step is important for removing debris and obstacles from the sand where new nests will be relocated. Sifting of the sand is the longest, most labor intensive, process in the creation of a new hatchery. Once all of the sand has been sifted and placed in the new hatchery location, it is time to make the surface flat and compact again. 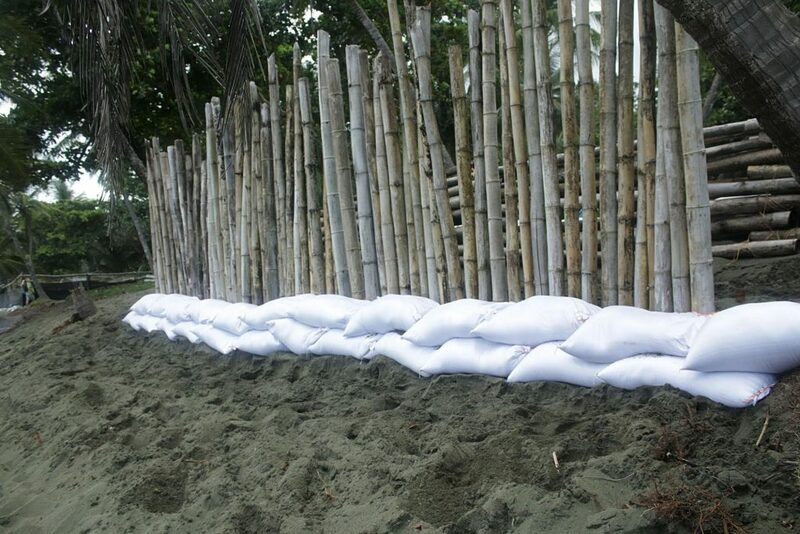 The next step is to fill hundreds of sacs with sand in order to reinforce the outer barrier of the hatchery fence, which provides protection of the sea turtle nests against predators. Predators of sea turtle nests include dogs, coatis, vultures and more. We then build the structure using newly cut recycled bamboo and cover it with nets to further protect it from predators. The final step is to section off the inside of the hatchery into a grid system which allows us to identify every nest inside. These codes from the grid system make it easier for us to track and predict when the nests will hatch. As you can see, building and maintaining the hatchery each season is hard work. Thankfully, we have the help of volunteers and school groups that come to help move the process along. It is fun work done along a beautiful beach! Not to mention, we get fresh coconut water during our breaks! Aquaculture: A Sustainable Solution to the Global Seafood Crisis? The world’s seafood stocks will have completely collapsed by the year 2050, scientists say. According to a study done by a group of economists and ecologists, the growth of the human population combined with unsustainable fishing practices and the devastating loss of biodiversity will lead to the collapse of fish populations in the next 35 years, if trends continue on their current path. If the idea of losing all of the world’s fish scares you as much as it scares me, then you’re wondering how we disrupt the current “trend” of unsustainable overfishing. One option is through the use of aquaculture. Aquaculture, also known as fish or shellfish farming refers to the breeding, rearing, and harvesting of plants and animals of water environments including ponds, rivers, lakes and the ocean. Although the global community is just beginning to think of aquaculture as a potential solution to the dilemma of depleted oceans, the fact is that it’s not a new practice. In fact, although historians say that the cradle of aquaculture existed in China 4,000 years ago, recent archaeological evidence (2003) suggests that the Gunditjmara tribe of Australia already had a system to raise and cultivate eels in in the southeast of the country 8,000 years ago. The system was so efficient (after being designed as an alternative method for procuring food) that traditional practices remained stable throughout history!! Or at least not until Stephan Ludwig Jacobi appeared on the scene, at some point in the early XVIII century. Thanks to Jacobi and his article ‘Von der künstlichen Erzeugung der Forellen und Lachse’, aquaculture became a part of mainstream science due to the success based off of his experiments in the external fertilization of trout and salmon. Not only in terms of self-sustainability, but also of commerce at an industrial level. From then on all manner of projects and investments began, and thus was born the second generation of aquaculture─ the modern aquaculture we all know today, and which is currently reinventing itself to adapt to a society increasingly aware of its impact on the environment. Part of this shift in the way aquaculture utilized is the utilization of what’s called Integrated, multi-trophic aquaculture. While it sounds complicated, it’s an idea that involves the raising of diverse organisms within the same farming system, where each species utilizes a distinct niche and distinct resources within the farming complex. This allows the fish to be raised in a much more biodiverse, nature-like setting. Additionally, this system utilizes a circular economy–the idea that the waste from one product serves as nutrients for another. So, raising plants and fish together both cuts down on cost and waste. 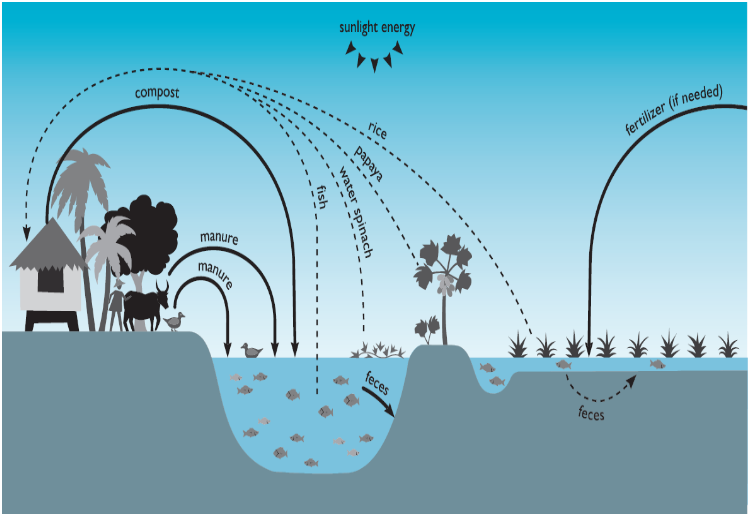 This current of change, in conjunction with the holistic approach that Osa Conservation has in regards to conservation, is what prompted the organization to plan the future fusion between a multi-trophic aquaculture project (still in development), and its already successful sustainable agriculture program. 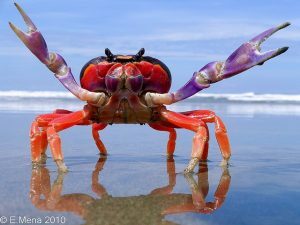 A large number of scientific publications (many published by the Food and Agriculture Organization of the United Nations) support these projects, and the tropical climate of Costa Rica is perfect for local breeding of sea creatures. What’s the harm in trying? The integrated, multi-trophic aquaculture system mimics the relationships among organisms in the natural world (not just by raising aquatic organisms and terrestrial plants together, but also by using one organism’s waste as input for others). It also ensures both the optimal use of resources and the reduction of water pollution and eutrophication levels. This new and improved system of aquaculture represents a positive step towards the self-sufficiency of Osa Conservation, and as such also represents a reduction of costs in terms of food imports from San Jose. Likewise, the implementation of a new food cultivation system could mean new employment opportunities for locals. 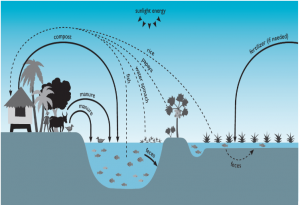 Not only is the integrated, multi-trophic aquaculture system is easy to understand, but it has the potential to include human waste as part of its cycle. That means that both the system’s facilities (eg tanks external fertilization, duck ponds, rice fields, etc) as food produced through it (eg shrimp species, and native fish) have potential to serve as educational material for both the local community and visitors of Osa. What better way is there to learn about aquaculture, than to see how everything works and then personally taste the final product? Adopting a system of aquaculture in the Osa will allow OC to expand upon its teaching capacity and further embody its own standards of sustainability. 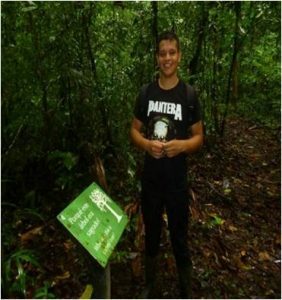 Integrated Multi-Trophic Aquaculture: What it is, and why you should care…..
Hello my name is Kenroy and I am a student at the Professional Technical College Sabalito (Costa Rica), a school in which students can study rural tourism. Over the past three years of studying in this program, I have learned the importance of tourism in Costa Rica. At the end of our three year program, students choose a place for supervised practice, in my case I chose Osa Conservation. This organization carries out projects related to volunteerism and research, in addition to the monitoring and conservation of wildlife. Osa Conservation opened the doors for me to practice my skills. I arrived on October 6th to the organization’s field station located in Piro, one of several properties that Osa Conservation has in this area. Simply arriving was a great adventure, because I took many forms of transportation to get there from my home in Sabalito. One of the most interesting legs of this is the boat leaving Golfito crossing the Golfo Dulce. In the 30 minutes it takes the boat to reach Jimenez you can admire many beautiful landscapes. If you’re lucky you might even catch a glimpse of dolphins and whales! I also found the “colectivo” to be an interesting and unique travel experience. This is the only form of public transport used to reach the station in Piro and is a large truck with benches in the back. Although the journey is long and bumpy, it’s very important and worth it because it allows tourists and locals to travel around Osa and to Piro. 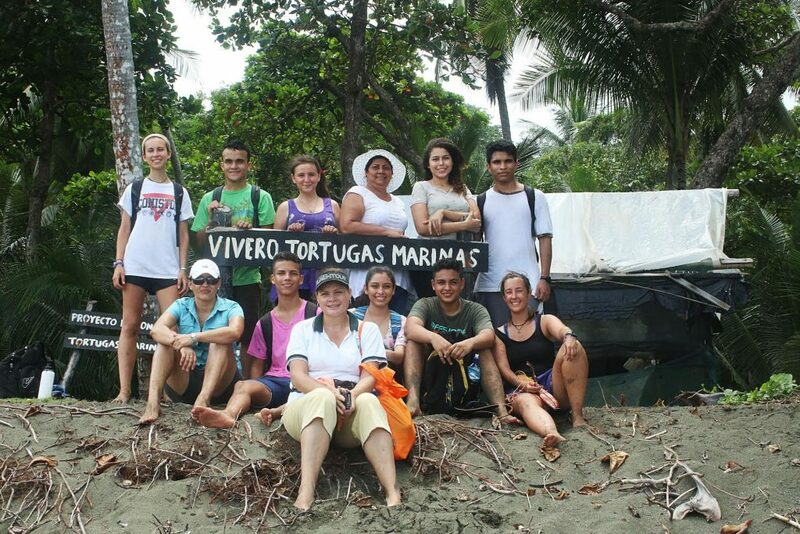 In this organization, volunteers help with projects such as beach cleaning, turtle patrols, monitoring big cats, working in the nursery, sustainable agriculture, reforestation, and general conservation. One of the most exciting things is the work done with sea turtles. I have seen very few turtles in my life, so this is a great opportunity to learn many things about them and their conservation. The work done in the vivero, or sea turtle nursery, is also very important, because each time you find a nest in a vulnerable area, where the tide can expose turtle eggs, they are extracted and taken to the nursery. Here they are in one place safe, in the right temperature and without predators. This is a way to ensure the successful birth of most of the turtles. It is a beautiful experience because when the turtles hatch they are released on the beach, where they swim out to sea to begin what we hope is a long life. I have also been working with camera traps, which are a form of wildlife monitoring that runs 24 hours a day. Thanks to the camera traps, Osa Conservation can keep track of cats and other mammals that would otherwise be difficult to observe. These cameras are placed at strategic points throughout the property and Osa Conservation is encouraging and training other landowners of the Peninsula so that they can monitor their properties in order to create a larger network of eyes on the Osa. Cleaning of the beaches has been one of the most rewarding experiences I have had since I came to the the Piro station. I hope to have many more amazing experiences in the next two months, to contribute as much as possible to this organization and of course the conservation of the Osa Peninsula. The fluttering of papery wings; back and forth, back and forth. They open and close their tiny mouths. Nocturnal hungry bats, paired with the incessant whir of cicada wings and the low, ominous drone of Howler monkeys are the evening calls of the Osa. These sounds signify the awakening of all things that dwell in the night. Usually, it also signifies our bedtime; unless it’s an evening of turtle patrol. When I took herpetology as a senior in college three years ago, my professor used to joke that, “Herpetologists are the night-owls and ornithologists are the morning people”. But, working with sea turtles breaks the mold. Sometimes, we rise at 3:30am. 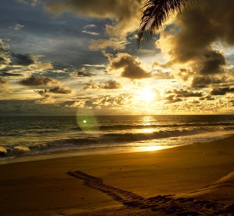 Donning our headlamps, we make our way down the winding forested trail to Piro or Pejeperro Beach, and scout for turtle tracks and hatchlings as the sun paints purple and pink ribbons across the sky. Sometimes, we have to sip on coffee (like the local Ticos do) post-dinner to keep us from falling asleep before a night patrol. Patrols typically begin at 8:30pm and can last beyond 1:00am. In my three weeks of being here, I’ve seen five Loras (Olive ridleys) and two Verdes (Greens) gingerly crawl from the surf to lay their eggs. I’ve measured their shells and tagged their flippers . And just last night, we saw a white light flashing ever closer to us on Piro—a sign of poachers. We had to abandon patrol. 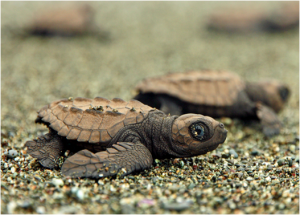 Poaching of turtle eggs is a sad reality here in Costa Rica. For many, it’s a feasible way to make a living and support a family. 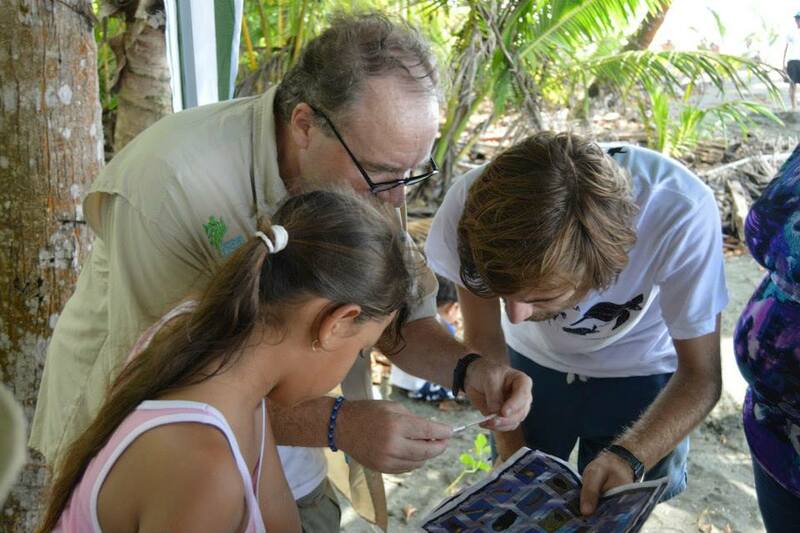 But through education, the next generation can learn the importance of conserving their country’s already threatened sea turtle species. 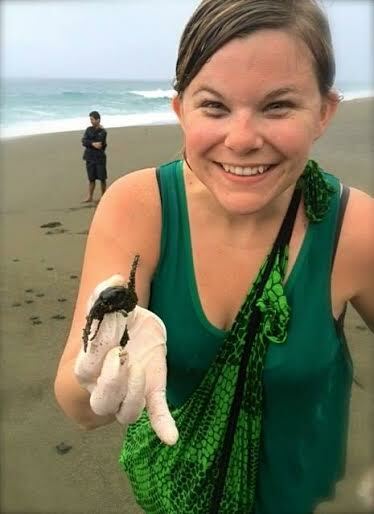 As a sea turtle Research Field Assistant, my main responsibilities are conducting patrols, maintaining the hatchery, and providing a steady presence on the beach. But the Carate Sea Turtle Festival last Saturday reminded me of my experience with outreach education. The enthusiasm and receptivity of the children around me was incredible, whether they be Spanish speaking locals or English speaking visitors. All partook in eagerly picking up and exploring local invertebrates with spoons and forceps, and dashing around the beach like a mother turtle (but a little faster). They learned what sea turtles eat (seagrasses, sponges, jellies, ect. ), what they accidentally eat (plastic), and how we can keep plastics out of our ocean by using reusable alternatives. Later, we danced to a local band that sang songs about el bosque and la playa and the animals that call them home. Mid-dance, I helped a local toddler collect hermit crabs in a bucket. It didn’t matter that I hardly speak Spanish; our enthusiasm spoke for us. 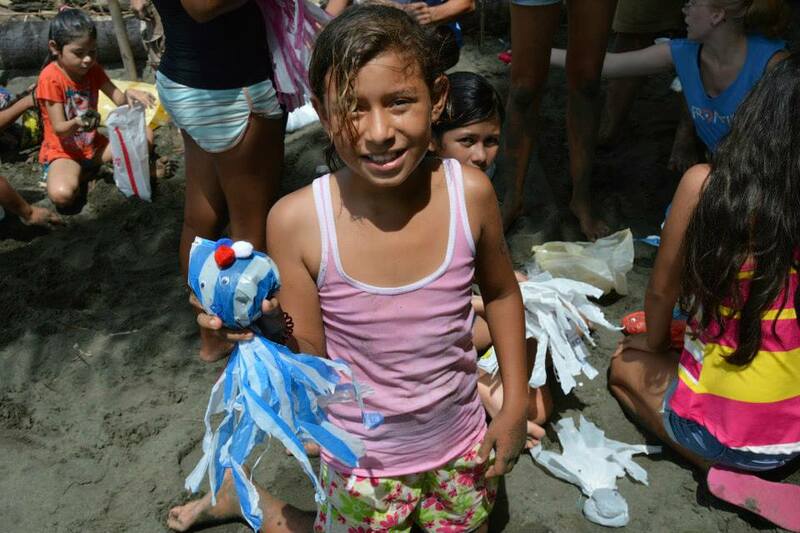 I can only hope that every child I met in Carate shared a similar enthusiasm and will remember the day we celebrated sea turtles, for their future is in all of our hands. 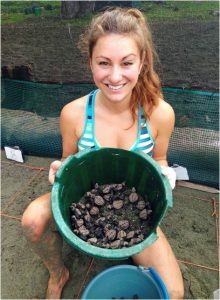 When I came to a yoga retreat in the wilds of Costa Rica, I had no idea one of the best memories I’d take home at week’s end would center around turtles–tiny baby ones, all girls. But when Manuel Mendoza of Osa Conservation visited Blue Osa Yoga Retreat & Spa to tell us about the work he and his team of volunteers do to protect these magnificent, highly endangered creatures, I couldn’t believe how paramount the need was, and was excited to become involved. I dragged myself out of bed the next morning at 5:30 am–quite an accomplishment as rain pelted the metal roof of my temporary home, lulling me into a deep sleep I’ve only achieved on tropical vacations. My travel companions and I bounded into two 4-wheel drive vehicles and headed south along a pothole riddled road to the end of the Osa Peninsula, one of the most bio-diverse regions on earth. Manuel greeted us at the gates to his compound, an open-air Cocina with a separate building for offices and research, surrounded by immense green space and backing up to rain forest as far as the eye could see. This did not look like a suitable home for sea turtles. The Blue Osa crew was directed to choose from a bushel basket of rain boots, the purpose of which was somewhat lost on me since I was already completely soaked, head to toe, just from making my way from the car. Manuel said we would make a short hike along a muddy jungle path to get to the hatchlings waiting on us to set them free into the great Pacific. This was not a leisurely stroll through the woods. We walked at a brisk pace, wading through rivers, tripping over enormous tree roots, and slipping in the mud as we went. Finally, in harmony with the jungle sounds, the roar of the Pacific drew us near and motivated me onward through the unfamiliar territory. When the forest cleared, churning waves pounded down aggressively in front of Osa Conservation’s hatchery. Manuel took us through deep sand to the hatchery where we became mesmerized at the big life coming from the group of small creatures. It was otherworldly to reach down and touch the babies, the textures of their feet and shells connecting me to nature in a way I’d never been before. They scuttled around the buckets we hauled down the beach toward the release area. Our emotions were running high at the task ahead. Manuel indicated the proper spot and gave us guidelines for the release experience. The numbers were not in the little ones’ favor. 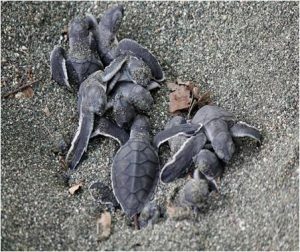 Of our 250+ hatchlings only one or two were likely to survive due to the factors working against them. But we didn’t lose hope. It was a mix of emotions as we pulled each little life from the large green containers and encouraged them down the wide stretch of beach toward the water, which calmed a bit in their good fortune. The journey for them was short, but for me it had a long-lasting effect. Watching the babies get swept bravely into the sea inspired me. I was filled with joy to have participated in such a pivotal experience. When I returned to Blue Osa that evening, I spent time on my yoga mat thinking how the impact the hatchlings had on me exceeded the impact I’d had on them–and how Osa Conservation’s efforts are impassioned and infectious. My body might have been recovering from the hike–achy and blistered–but my soul was content. Rainforest hiking and nature preservation had never been in my immediate skill-set, yet I found a way to make a difference in the Osa. When photographer/writer Leah Wyman found herself in the midst of a quarter-life crisis, she left her job in the church world for the sanctuary that is Blue Osa. A classical singer, composer and conductor with a B.M. degree from Manhattan School of Music and further studies at the University of Oxford in England, Leah is finding inspiring new ways to use her voice–in harmony with howler monkeys, scarlet macaws and crashing ocean waves at blueosa.com. On a sunny October morning on Carate beach we had the joy of celebrating the 6th Annual Sea Turtle Festival. 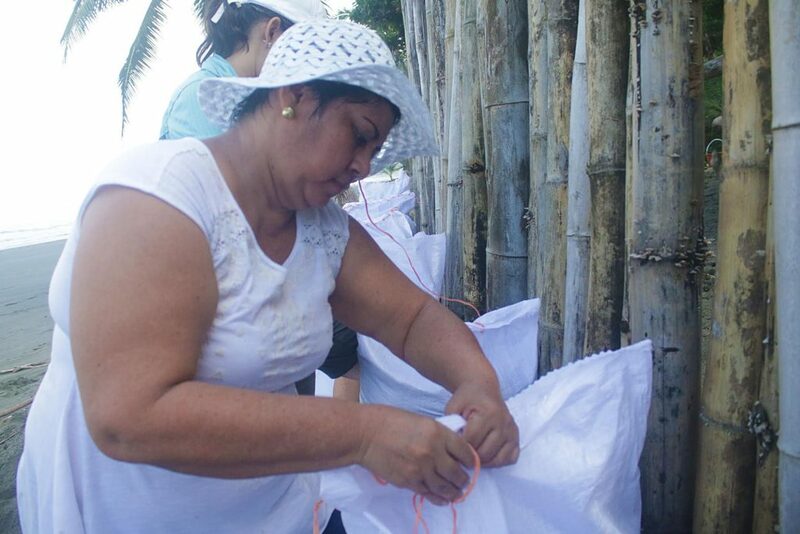 We had over 100 participants from the Carate community, neighboring communities and from Puerto Jimenez. To the rhythm of music we begun the first friendly competition: Sandy Sea Turtle Sculptures, with the theme being that of “What does a Sea Turtle eat?” We had three winning families, and they each took home t-shirts with the festivals yearly logo on it. We continued the fun and celebration by opening up a racetrack where groups of 3 children had to respond to different questions about biology and sea turtle conservation. 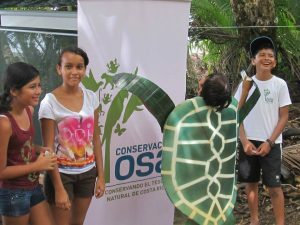 All the festival participants, children and adult alike, learned many different aspects of sea turtle adaptations, diseases, and how to evaluate a sea turtles health and how to provide rescue – training based off of real activities performed by “Reserva Playa Tortuga” (Beach Turtles Reserve). Osa Conservation’s workshop taught participant about marcoinvertebrates that live in bodies of water and how to use quality indicators to evaluate water health. Theater, charades, face painting, and recyclable turtle and jellyfish sculpting, were just some of the fun activities participants got to participate and enjoy throughout the day. 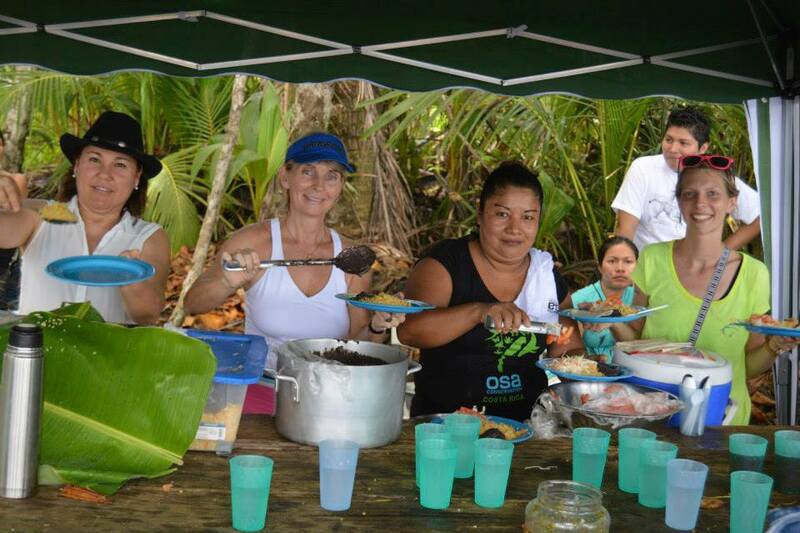 The whole event was rounded off by a wonderful lunch donated by the Carate community and Osa Conservation. What a great day! If you would like to see more pictures click on the link to go to the Facebook Album! Written by Manuel Sanchez and Wanda Cope. It may be the world’s largest species of marine sea turtle, but it is also the most endangered sea turtle species, too. On October 16, 2014 we are delighted to announce that this critically endangered species still has the beaches of the Osa Peninsula as an safe nesting location. It’s gratifying evidence that all of the effort that have been put fourth to protect this majestic creature, along with the other six remaining species of marine turtles, have come to fruition – this is definitely another reason to keep fighting the good fight and continue on with our mission. In 2004 the first nesting Leatherback turtle was spotted on the Peje Perro beach by Manuel Sanchez and Pablo Modena during a beach monitoring effort – since that year there has not been another sighting on the beach again. 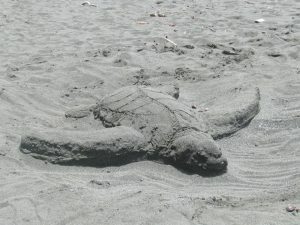 In 2013 it was identified that a leatherback turtle had laid one clutch in the 29th sector of the beach. Finally with much happiness we had another official sighting on October 16, 2014. 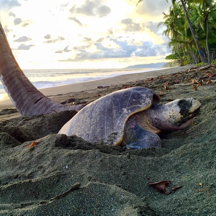 Once again the sight chosen for nesting was on Peje Perro beach, and during the night patrol the tracks of a massive leatherback turtle were identified. 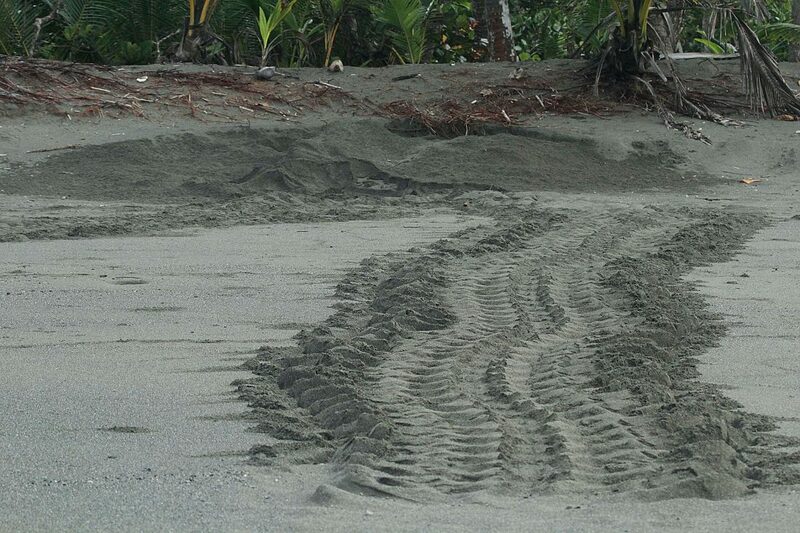 Initially the tracks led to a false clutch nest site on sector 29 of the beach (the same site as the 2004 nest), but ultimately not but 500 meters away did the turtle attempt and succeed at the construction of a new nest to lay eggs in. Coasts are continually in motion and are always a mixture of salt water and earth. The boundary between the ocean and land is in constant flux due to the tides. In the rocky areas along the shore the waves flood the pools made of rock only to slowly trickle out as the tide recedes. 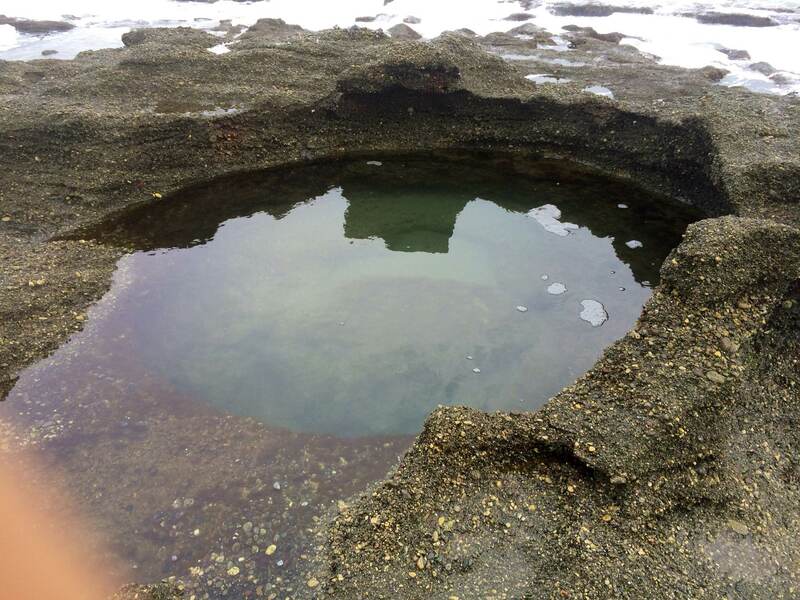 The many species these pools harbor are revealed as the waves ebb; some have become trapped there, while others have made this rocky habitat their home. 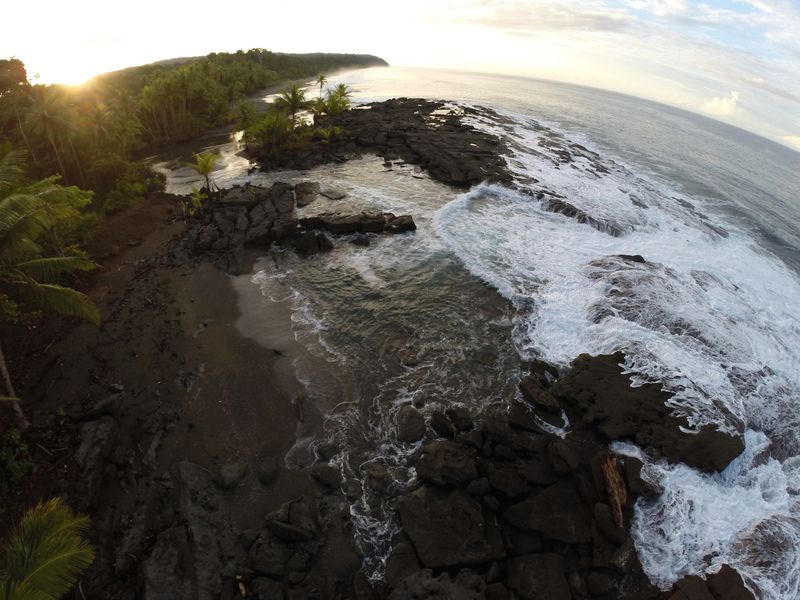 Photo 1: Aerial view of the rocks at Piro beach. Hundreds of species live in perfect harmony in these small areas, including species that are very tolerant as well as very susceptible to human activity. Fortunately, the beaches in Osa still have an endless amount of pristine pools along the coast, and Piro beach is a perfect example of this. 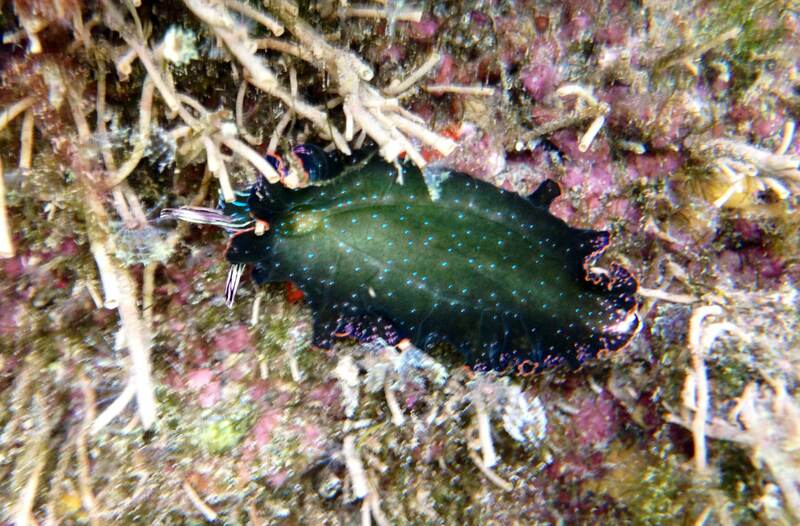 Several marine species occurring in the same place. The species found here must be highly adaptable to changes in water temperature, salnity, and dissolved oxygen, like sea anemones. 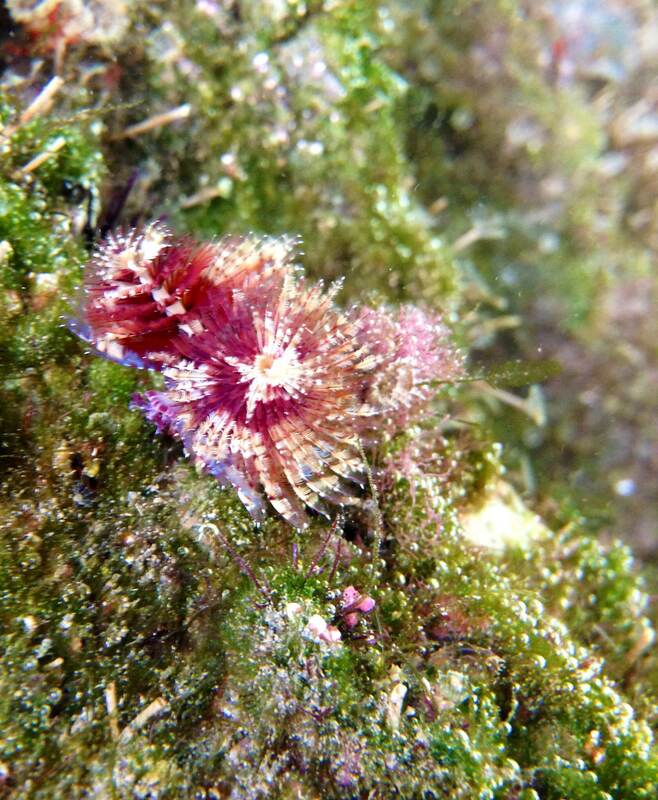 These benthic species can be as small as 1 centimeter and as large as 2 meters; the species in the tide pools are the smallest. 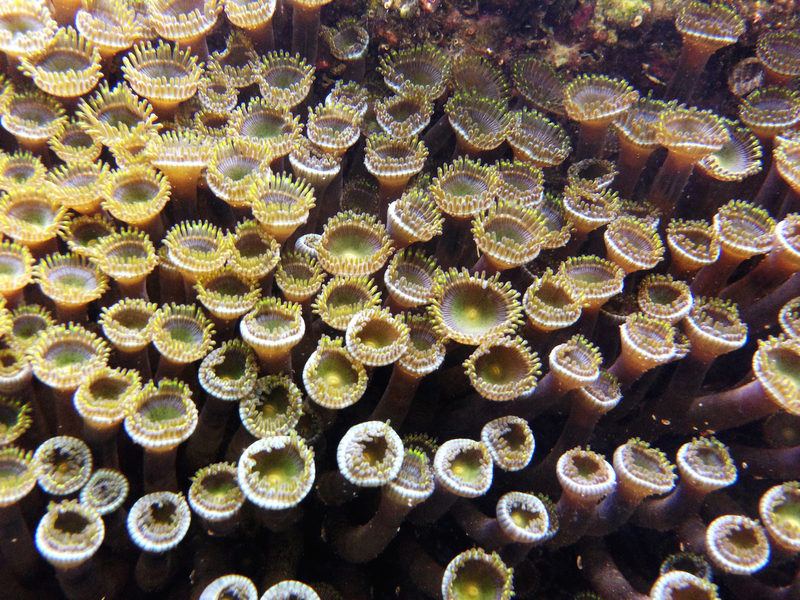 Their tentacles make them seem more like flowers rather than the tools used to capture small fish and invertebrates to feed upon. 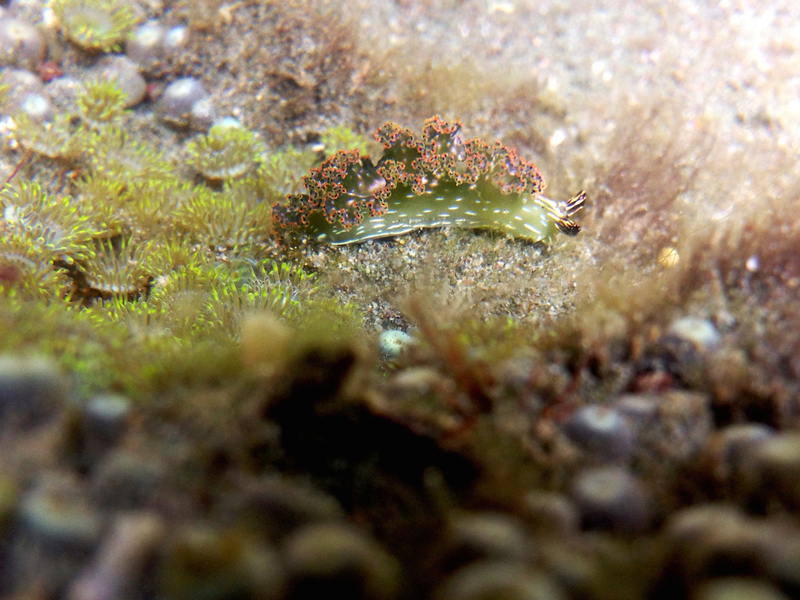 Sea slugs are mollusks without shells that have adapted to a benthic lifestyle, living off of small invertebrates that they patiently search for along the sea floor. 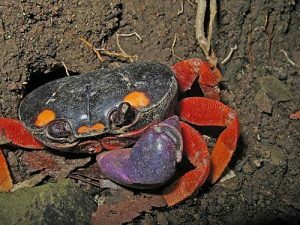 They are poisonous animals and hardly have any natural predators, thus having a shell is not necessary. 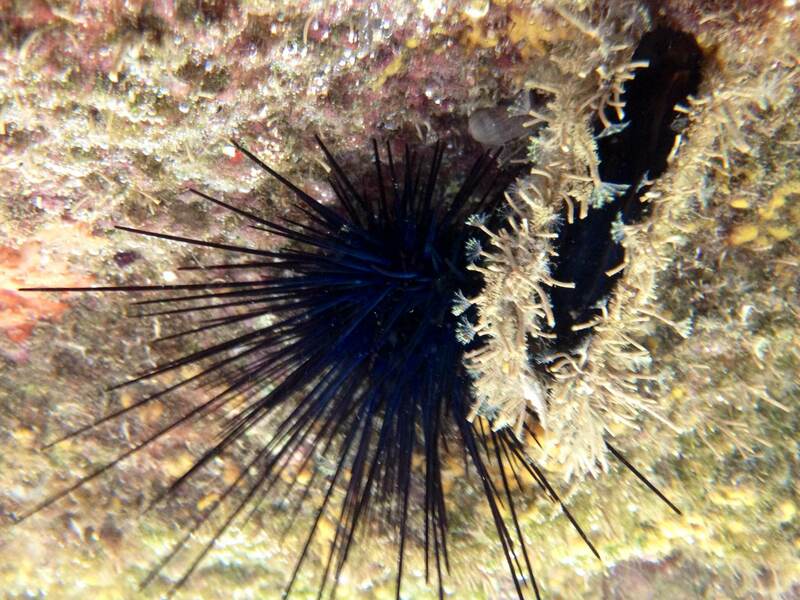 Sea urchins, on the other hand, are omnivores that search for any kind of organic matter along the ocean floor. 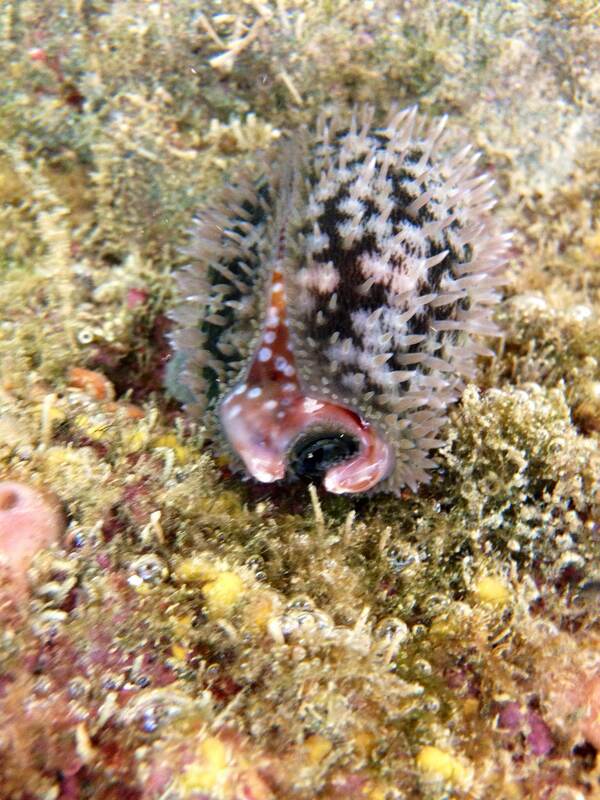 Their calcium structure forms spines, acting as a very efficient defense mechanism against predators. Sea snails are the group with the most abundance and diversity within the mollusks, comprising over 50 per cent of the 100 thousand known species of mollusks. Within the Cypraeidae family, shells are extremely smooth and shiny due to the fact that it is always cloaked by a protective cover while the animal is alive (Photo 8). Sea snail (Macrocypraea cervinetta) covering the shell. 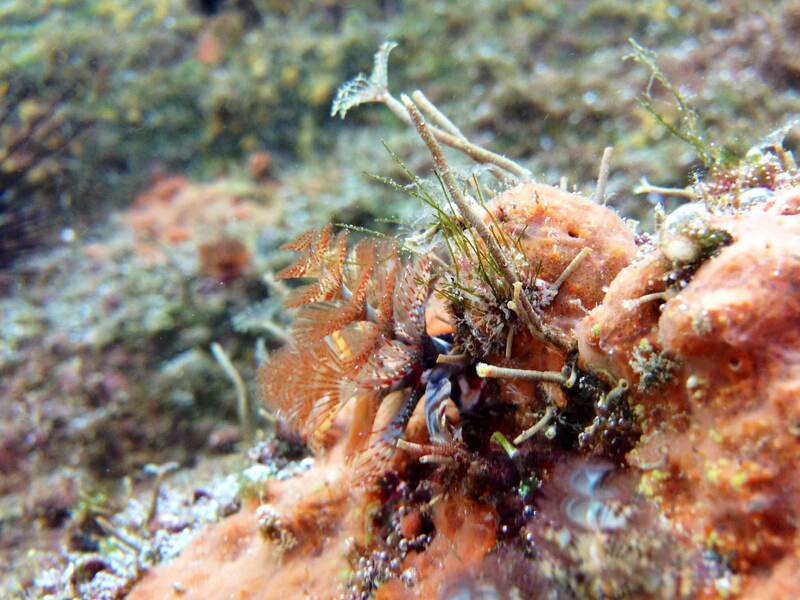 The Christmas tree worm is part of the Serpulidae family, and it inserts itself into living coral, only leaving visible two spiral crowns of diverse and intense colors . Their name is derived from their form and coloring. These plume like structures are used to capture suspended particles of food and plankton in the water. 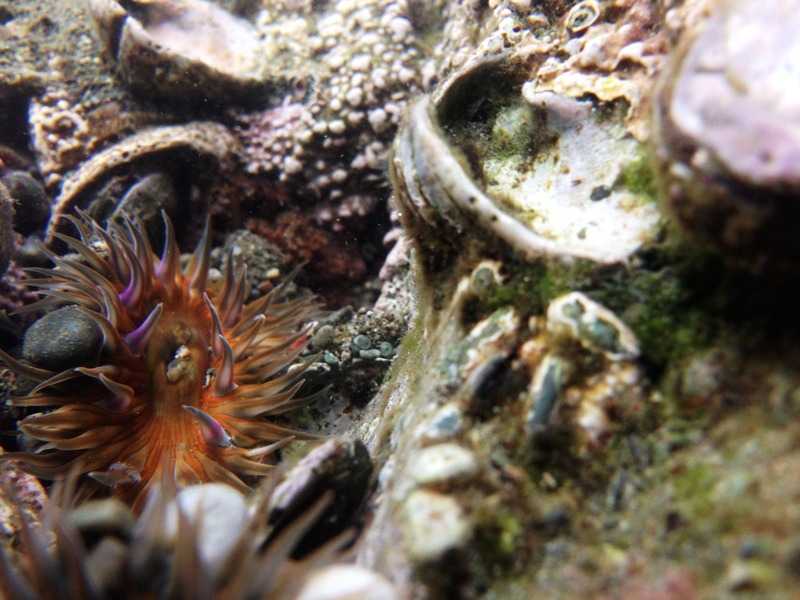 The tide pools are Windows to the sea because they show us a glance of the endlees number of species that live in the ocean but also that are complete ecosystems that we have to protect from human activities, pollution and development. 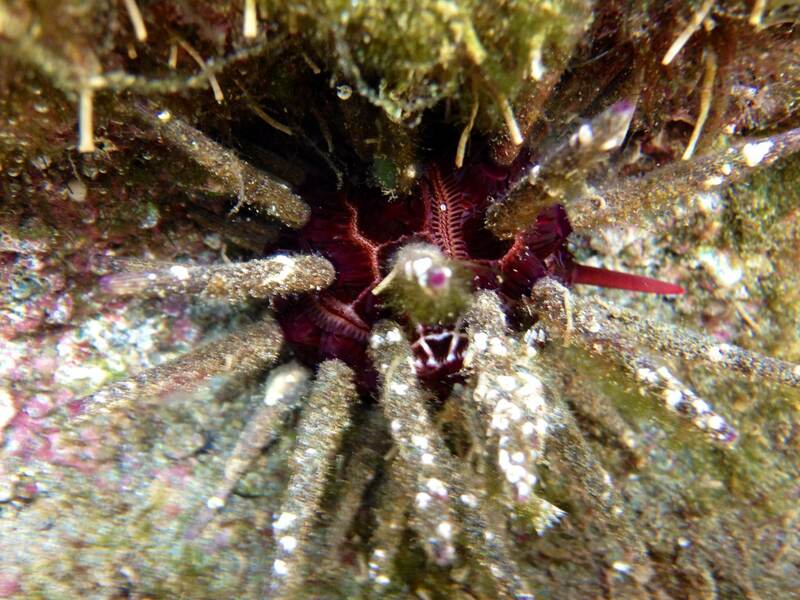 So the next time you go to the beach and find a tide pool pay look closely, maybe you can see one of these incredible animals, and of course if you ever have the opportunity, come and visit us in the Osa: where the rainforest meets the sea. 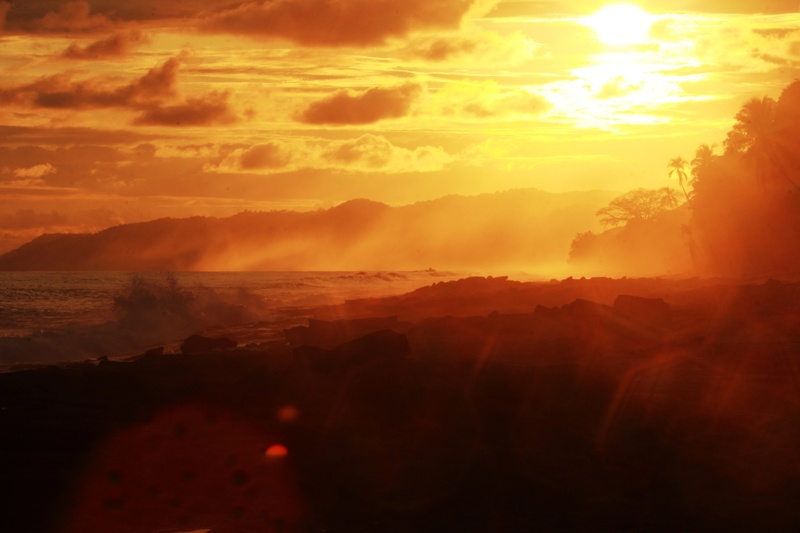 Sunset at the rocks in Piro beach.